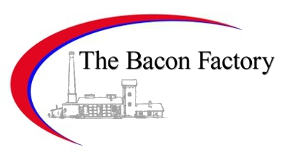 The Bacon Factory have a wide and varied range of bacon products available. Whether you want bacon smoked or unsmoked, middle, short back or streaky, The Bacon Factory produce only the finest quality bacon to be delivered direct to your door. Remember, Only the finest quality products will leave the Bacon Factory. With our experience and training, your in the right hands. - Our best selling top quality bacon, cut from the middle of the leanest driest backs. - Cut from the same quality backs but with a small amount of shoulder bacon in each packet to give quality at the best possible price. - Whichever cut of bacon you require, be it Prime or Selected we can smoke it for you. - If you like a traditional cut and a little extra for your money this may be the choice for you. - Popular on the continent and with our American cousins, over here its often used for wrapping other meats in the cooking process. We stock the leanest cuts of Streaky Bacon. - A very popular choice are our 8oz gammon steaks, although we can slice them in a number of different weights and styles, just ask our sales team for more information. - Our most popular are Corner Joints but if you'd like something a little larger try a Slipper Joint or perhaps even a Horseshoe Gammon. Our traditional preparation methods ensure that our clients are getting only the choicest bacon cuts direct delivered to your door. These are our main lines but its important to stress if you're looking for something that isn't listed, like a different type of sausage or alternative cut or cure of bacon just ask us and we will find it for you using our extensive list of contacts. Contact our sales team now on 0161 797 1100 or email sales@baconfactory.co.uk.